Around 1999, Jason started making websites on the side out of college and continued to take on side projects after his full-time day job. He learned html by himself with tutoring from a friend over email. But he learned a lot from the failure, what not to do next time, how to make it work better. He tried again in 2010 and has been freelancing full-time since. The first time he tried to freelance, he treated it more as a hobby, rather than a business. He sat back and coded without thinking about the business aspects. With the second time, he had to learn all the business stuff. He leveraged everything that had learned from his full-time work at agencies. When he was working at agencies, he learned about their pain points, how they operate, and the type of work they would hire an outsider to do. So he targeted agencies to start with because he understood their needs so well. That way, he eased himself into the business side of managing a freelance business by “outsourcing the sales” to the agencies and working as a contractor for them. Not to say that he didn't sell at all. He did have to sell his services to the agencies. But it didn't feel like selling. Went he met with the agencies, he could talk to them as someone who knew exactly the problems they were going through since he had been on that side before, staying up late to finish a project by the deadline, and offer his services of adding 10-15 hours per week as a developer for specific projects, if they need it. Since those early days, Jason has switched to targeting e-commerce businesses directly. They know that you can't just pop up a website and sell stuff online. It isn't that easy. There are taxes, shipping, inventory, marketing, or other complex problems that plague the e-commerce space. They understand what goes into making a good e-commerce site. Jason's experience and skills are best suited to helping these businesses thrive compared to someone who is just starting out in e-commerce and doesn't have a clue what to expect. Jason has reached out to WooCommerce, Prospress, and Drip. These are web tools that he uses all the time. He got to know the support team of these tools and eventually asked to get on their “approved consultant list”. That way, if someone calls in, asking for a service or one off project that they don't really do, they could refer that person to Jason. In return, Jason promotes these tools to everyone he knows so it mutually benefits everyone involved. Jason's other major source of clients is through referrals. Jason also goes to conferences, does some speaking, and generally networks. He has never used ads specifically because he isn't a sales guy and it isn't natural. He prefers getting clients through connections. 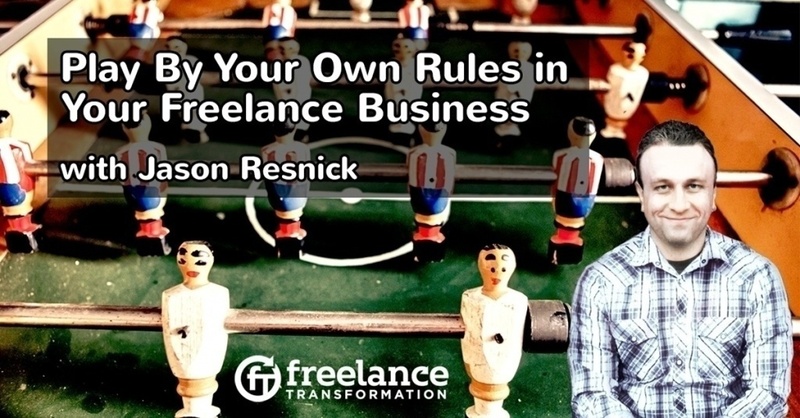 He doesn't need a lot of clients as a small freelancing business, so these methods works really well for him. Jason maintains monthly contracts with his clients. That way, they aren't locked into a year-long commitment if they feel that he is no longer providing them with value. Projects that Jason takes on are often 6-month long endeavors. The first 3 months are the hard work, talking about strategy, implementation, and actually do what they discuss. The second 3 months are about measuring, tweaking, and optimizing. The first meetings are difficult because it requires the client to specially say what they want the business to look like in 6 or 12 months in order to create a game plan. Not just “I want more sales.” Jason gets them to say a number, 20% more sales, 15%, etc. That is the only way to measure success. Jason really digs into the business problems that his clients are facing. Not just looking at the website and what he can do to create an e-commerce system. Understanding the client's business allows him to make the strategic plan to help the client get to their goals, and even help the client define those goals in the first place. If a client had 100 sales last year and want 1000 sales this year, a lot has to change. It might not be possible, and is probably not a realistic goal. That's where being honest with the client and communicating clearly with the client is very important. Jason has the experience to know from looking at the current way that sales are done, what tools he can implement to meet specific sales goals. But even if he did everything in his toolbox, some goals are still unrealistic. So it is very important to talk to the client while also not demoralizing them or talking down to them. Don't just do what the client asks you to do. Think through the problem with the client. A lot of the requests that Jason gets are “I need a new store,” “I need a new design”, “My online store isn't working.” When Jason hears these comments, he needs to dig deeper. Often, the problems he discovers are not what the client thought were the problems. For example, clients often thing that the problem is in the design of the site. But when Jason looks at the website, he finds that the customers put stuff in the cart, then never complete the order because there are too many distractions on the cart page so they don't end up moving to the next step of paying. Most of the time, Jason does tweaks rather than full redesign. So over a period of months, Jason does a bit more and a bit more. For example, he may start by removing distractions during the check out process. Then, he may implement an email sequence that contacts customers who left stuff in their cart, but haven't purchased yet. Then, he might do testimonial campaign or self identifying campaigns to get customers to come back to the site. With each tweak, Jason's clients see more sales, so they see his expertise and the results so they want to continue working with him. Because clients see the results in the first couple of months, Jason doesn't have to convince them to keep working with him. The results speak for themselves, and there are always more tweaks that he can implement to get them more sales. Missing the mark, own up. During regularly scheduled weekly calls, Jason will go through the progress towards the goals. He evaluates with the client if they are on track to meeting the objective or if they are going to miss the mark. If they are going to miss the mark, they work through why they will miss it and try to figure out if they missed an assumption, misestimated something, the client didn't meet some obligation, or something happened that couldn't have been predicted. If Jason makes a mistake, he owns up to it. Be transparent, not flaky. If you aren't the first person that they hired, then the last person they worked with was fired for some reason, often due to dishonesty or not being clear or transparent. If you make a mistake or for some reason, the mark was missed, you will inevitably be behind on what you promised the client. That's ok and completely understandable. Once you've fixed the problem, or think that you've fixed it, you have to diligently monitor the results, such as number of sales. You can try to catch up the next month and get more sales than expected, but for the most part, you are playing by ear. It's a give and take with the client. Jason will go to great lengths not to give money back. Instead, he suggests that they see what happens. They missed the mark this week, that doesn't mean you will miss the mark next week. It may have been a bad week despite what you did or did not do. Jason has 6 steady clients and rotate out 2 clients per year. Jason has a quarterly “temperature” call that lasts 10-15 minutes. He has a conversation to see if everything is on the same page and everything is going well. He doesn't want issues to fester and would rather address it right away. If they are a new client, Jason will ask why they hired him. If they are an existing client, at least a few months in, he will ask, “Why are you still here? Why are you still paying me? Why am I still working with you?” Often, the response is that he is the liaison between the web and their business by implementing their business online. And finally, “What can I be doing more awesome?” He tries to get at what the client doesn't like about his services. Often, he gets answers about stuff that he just doesn't do, showing that the client expectations of him and what he offers aren't aligned. He can now address these. Or it can be a small thing like the time slot of the weekly calls. Jason uses the insight about why clients stay from these calls in his sales meetings with prospective clients. But even if clients love you, if they don't have any more work for you, then they will stop being your clients. He makes notes along the way of implementing the original plan and contract of other parts that he could implement and other bits of project he can do. For example, clients will often think of some new thing that they can implement, like Facebook ads, and want to jump on it right away. At the time, he will tell the client that this particular feature or campaign would be part of a future phase of the project. When he comes to the end of the original contract, and there are no obvious next steps, Jason looks back at these other directions and refreshes the client's memory. If the client had requested something that Jason doesn't like to do or isn't good at doing, Jason will bring in a trusted resource to do the request. For example, Jason would bring in someone who is really good at Facebook ads rather than trying to figure it out on his own and do a half-decent job at it. Jason has established processes for everything, from when to contact clients (weekly progress and quarterly temperature calls), to how to run a project through phases (diagnosis of business problem, implementation, monitoring and tweaking). “Processes” for Jason are simply google docs that he wrote explaining how to handle sales, how to handle kick off meetings, how to handle on-boarding, templates for calls, all that stuff. From there, he figure out how to automate some of these processes. He looks to Zapier and IFTTT to connect different online tools such as Drip for automating client workflow, Calendly for scheduling, and Freshbooks for invoicing. You have to first do everything manually. Then you can start automating. That prevents things from falling through the cracks – which is super stressful for you and the client. All of these systems and automations help save you time.